The Hatter always was a little...strange. After all, Mad is his middle...no first name! (Which we're sure carries much more weight.) It's one thing to be mad, though, at least he's a little cheerful then. Now the Mad Hatter himself has taken a bit more of a lonely path down the road to madness. It's a little less colorful and a lot more bleak. One could say he's taken a sort of dark turn. 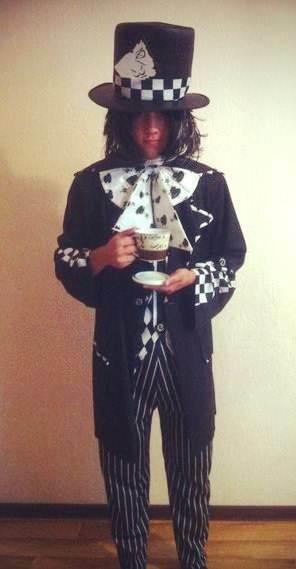 He likes his tea without sugar now and his laughs are a little more diabolical than ever before. His riddles have a bit more of a deadly punchline, even if you get it right. Alice better be a little more careful next time she comes back. Wonderland is taking a turn for the dark side. Before long it might have to change its name to fit the mood. 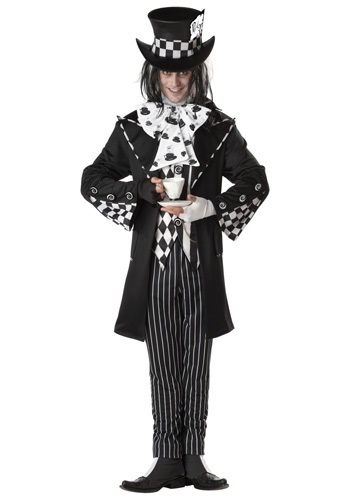 Leave your friends a little uneasy around you this Halloween with the Dark Mad Hatter Costume. This costume comes with everything you need to get this lonely, mad look for Halloween. The striped pants have an elastic waist for comfortable fit. The vest has, fittingly, mismatch front panels and the accompanying black jacket has edging and sleeve cuffs with a checkerboard pattern. 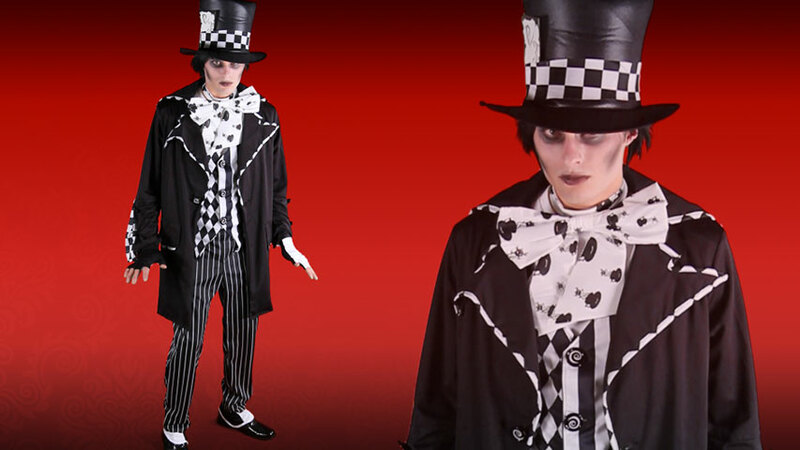 A black and patterned foam top hat and half black, half white spats and gloves are also included to take it to the next level! Just grab your favorite cup of tea and slap on a bit of a silly grin (not quite like Cheshire cat's though) and perplex your friends with the strangest behaviors that you no longer even understand. It's all an unpredictable world of madness when you fall into the rabbit hole. 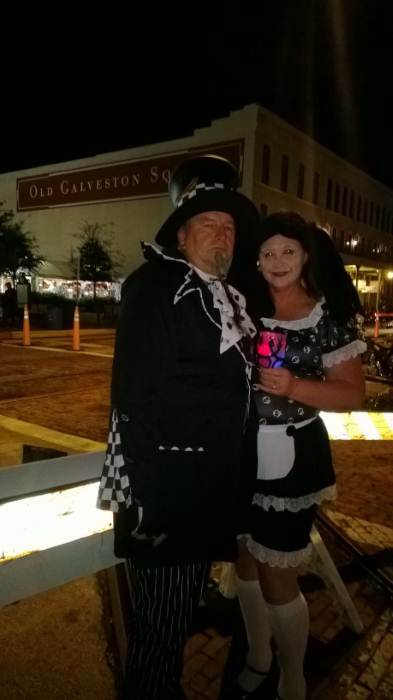 Great costume - we won the couple's costume contest! Well made and inexpensive costume. bought this to wear to the rally. It was a hit. So many people stopped us for photo ops! The good and the bad, but mostly good! So getting set up for Halloween here and have had a couple of days for my costume to "sink" in. Disappointments: Might as well get to this right away. The hat is not like that in the picture. The hat in the picture is sharp and has form. The hat that I received was for the most part "square" or "blocked" and the rim was flat and did not follow the lines in the picture even remotely. I had read other reviews where they said that the hat came flat in the box and some had trouble straightening it out. I fixed that by using a pendaflex folder and cutting it to the size of the inside of the hat. Stands up great, nice and tall and the hat still looks nice, even though it's not like the picture. The tie is not nearly as full as that in the picture. I would say that the tie that I received was about half the size or less. It's still workable, but not nearly as robust. The good part: It's a cool costume. I'm sure that I will get lots of complements. The vest was a little small but everything else fit as I expected based on the size. I got the Large (42-44). I'm 6' 190 lbs. 34 in waist, 44 chest (I must have grown! Measure yourself before you order!). The vest seemed to be smaller in scale than the jacket, which seemed to fit okay. The material is nice and good quality. I was able to iron it fairly well using the silk setting on my iron. I was careful to go up in temperature until I got the desired result without damaging the material. I continue to be pleasantly surprised with our orders! They are fun and made with a quality that I was not expecting; my family is exited about Halloween again and I am so happy! great quality, awesome costume! Came with everything but makeup & wig (wasn't needed!) Looks great with the Dark Alice costume!!! Thanks for another great purchase!!! 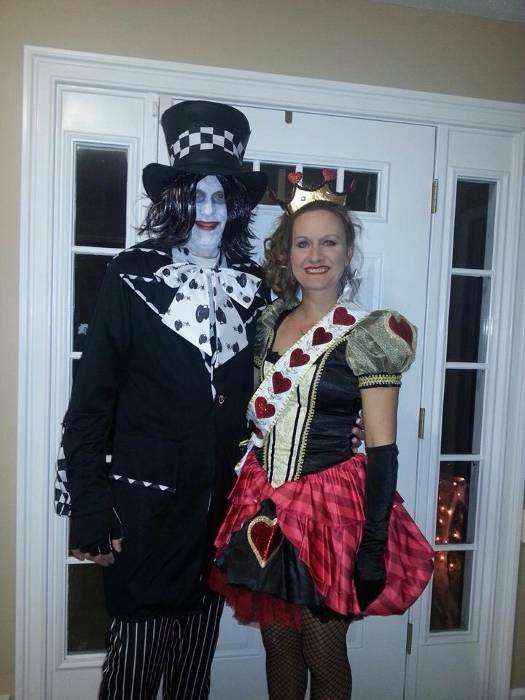 awesome costume , fit my husband perfectly! It came in the mail really fast and its good quality, for sure going to get the whole families costumes for here next year!!! Came with striped pants-not shown in photos. Hand covers, tie, shoes covered! My husband looked great ! I won a couple of costume contest!! Good quality, fun outfit. Over the top considering its reasonable price. This is an amazing costume! So many pieces and so fun! Had the best time wearing this. Everyone loved this costume. This is an amazing costume, color, hat, everything, I´ve already fit it, perfect:)). I´m ready for the Tenerife´s Carnival!!! !